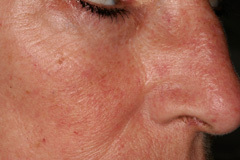 Photo Rejuvenation is a cosmetic treatment designed to produce younger and healthier looking skin. As most of us age, we begin to see visible signs of sun damage, ageing, and lifestyle choices appearing in our complexion. This change in appearance may include freckles, Rosacea, wrinkles, broken capillaries, dark spots, blotchy skin colour, redness of the face and neck, enlarged pore size and uneven pigmentation. Photo Rejuvenation can reverse the signs of ageing on the face, neck, chest and hands. The gentle lasers correct pigmentation irregularities; and encourage new collagen growth, to smooth out existing facial wrinkles. Lines are minimised by tightening of the skin, and the size of pores are reduced. Results are a fresher, brighter and more toned skin, giving you a new, more radiant look. 1) What are the benefits? The red pigment in the blood of the broken capillaries and spider veins absorb the KTP laser energy, causing an immediate collapse of the unwanted vein. The KTP laser is readily absorbed by the high concentration of melanin found within freckles, sunspots. The rapid absorption of laser energy heats the melanin and causes the destruction of the melanin-rich cells. To smooth out existing winkles the KTP and Nd:YAG lasers tighten the skin and close the pores by encouraging new collagen growth. KTP and Nd:YAG lasers encourage new collagen growth resulting tighter skin and reduced wrinkles. 3) How soon will I see the results? Effects are cumulative. After the first treatment you will see improvements to pigmented areas within few days but the outcome of the treatment for broken capillaries and small facial veins is immediate. Other improvements such as wrinkle reduction and toning will be gradual. 4) How often can I have it done? 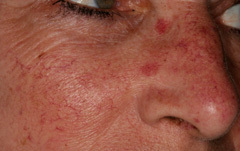 One to two sessions are needed for treatment of broken capillaries and pigmented areas. For skin tightening and new collagen growth a series of four to six treatments, spaced two to four weeks apart, is the standard recommendation. 5) What can I expect immediately after treatment? Immediately following the procedure you may experience some slight redness, swelling and/or a slight darkening of pigmented areas. The redness usually dissipates within a couple of hours. However, darkened pigmentation may persist and flake off for up to one week. Makeup can be applied to the treated areas immediately, if necessary. It is important to apply moisturiser and SPF30 sun block, and avoid sun exposure on a daily basis to prevent additional sun damage. 6) How long does it take? This treatment takes approximately 30-60 minutes. As each procedure differs according needs of the patient, the corresponding cost will vary. You will be advised of the cost of your procedure at your free initial consultation.